Investing in yourself can sound like an odd concept. 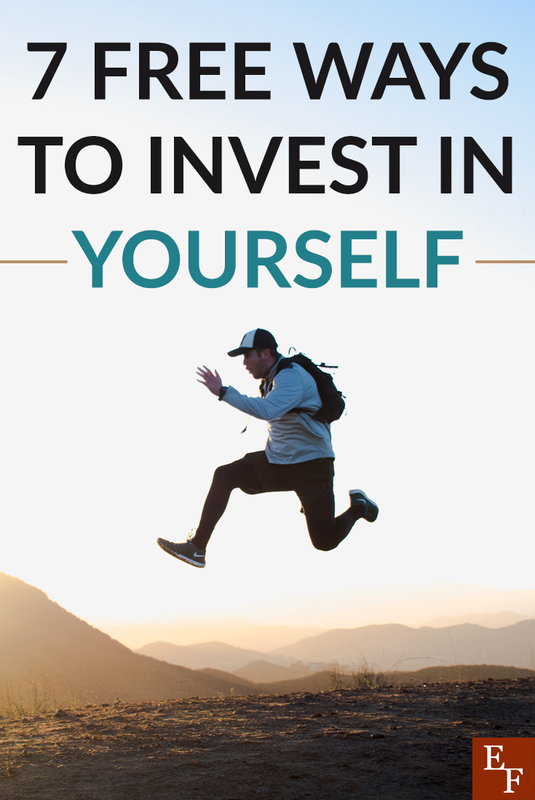 Regardless, whether you choose to develop a new skill or grow yourself professionally or personally, finding ways to invest in yourself can be more valuable than you might realize. There’s no doubt you have professional and personal goals in your life. If you truly hope to reach them, finding ways to develop yourself can help you achieve those goals that much faster. Moreover, if you find yourself leading or serving other people, investing in yourself can lead to a better you. In turn, putting you in a more apt position to do so. Whatever your reason, investing in yourself doesn’t mean you have to pay to continue your education, or even cause you to purchase an array of books. Instead, it can be absolutely free. Here are seven free ways you can invest in yourself. If you’re someone who doesn’t tend to set goals for yourself in the first place, then doing so can be a great start to investing in yourself. Setting goals, whether in your personal or professional life, provides you with a purpose, something to work towards. And usually, those goals are set with the intention of bettering your life. Instead of going day in and day out, navigating life with no clear path, set goals that will serve to benefit you in the long run. That being said, remember to set goals that are specific and attainable. Ok, yes, books cost money. But, while some seem to forget about it, there is still a wonderful organization called your local library that allows you to read books for free. Plus, you no doubt have friends, family, and colleagues that are able to provide you with valuable reading material. No matter where you acquire your reading list, use your free time to expand your mind and broaden your knowledge base. Use books to learn a new skill or brush up on a subject you already know a little about. Furthermore, reading can help you gain new perspectives on the problems or tasks in your life that have you stumped or unsure. You never know how someone else’s story or thoughts can influence your mind. While most college and university courses cost money, thanks to the Internet, there’s a plethora of free courses and workshops available to you. Sites like Coursera and Open Culture allow you to sign up for and view free, online courses through universities. While you won’t receive a degree for taking a free course, the skills and knowledge you gain will be invaluable. However, degree or not, any skill you learn through any course is bound to develop your marketable skills. Plus, depending on the skill, it could help further you in your career. After all, as long as you can demonstrate working knowledge of something, it likely doesn’t matter if it’s what you studied. You’ve probably heard the phrase healthy body, healthy mind. As tough as it is to motivate yourself to get to the gym, this statement couldn’t be truer. Not only does getting active and exercising help put you in better physical shape, but it has myriad other side effects. When you’re active, you generally have more energy, you sleep better, are more motivated to eat healthier, and have an overall healthier mind as well. Working out, apart from the physical aspect, has a terrific way of helping reduce stress. In many cases it can help with clearing your mind to help you think better as well. You’ll be all-around better equipped to handle your daily life. Moreover, while exercising is vitally important to staying healthy, it’s also important that you get yearly physicals as well. Essentially do your best to do everything in your power to stay healthy. Networking might sound simple, as you probably meet new people every day. However, to truly network set yourself out on a mission to make true connections with other people in your community. Even if someone doesn’t necessarily work in your industry, you never know where a connection could lead. Along with networking, consider finding yourself a mentor, someone who is older, wiser, and who may have been in a similar position as you at one time. By having someone you admire be your guide in your career or life, you can gain valuable lessons, information, and learn from their past mistakes and failures. Getting out of your comfort zone is just that, uncomfortable. Nonetheless, it’s a surefire way to challenge yourself, to discover and learn something new. You might find that you can do something you never thought possible and learn that you’re stronger than you thought. Or you might discover a new passion or career path that you’d never thought of. Wherever a new challenge takes you, it’s bound to teach you more about yourself, which is always a good thing. Whatever hobbies you have or whatever task or form of entertainment relaxes you, set a goal to do something for yourself once a day. Life is hectic and stressful and nonstop. Most days you might be lucky if you get time to breathe, which is why no matter what it is, whether it’s reading a chapter of a book, doing some yoga, or spending an evening cooking, taking some time to perform an activity that you actually enjoy, can have wonders on your mental health. Plus, it’s usually free. We all have areas of our lives that we’d live to improve upon and grow in, and investing in yourself is the key to doing so. Make a point to think of all the ways you can put yourself on the path to your growth. Again, investing in yourself doesn’t actually have to cost you any money. In fact, some of the best things you can do are free. Regardless of how you choose to do so, you might be surprised how rewarding it can be to invest in yourself. What are some of the ways you’ve benefitted from investing in yourself? What have you done to invest in yourself?